Receive access to innovative Overlake therapies before they become widely available. 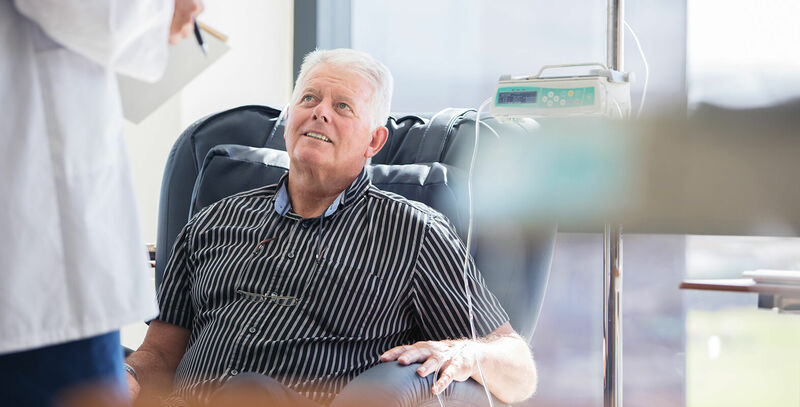 Patients who participate in clinical trials receive access to the current standard of care, as well as the potential to be treated with a new innovative therapy even before it becomes widely available. Other studies seek to improve quality of life for patients. A randomized, double-blind, placebo-controlled, parallel-group study to evaluate the effect of SAR236553/REGN727 on the occurrence of cardiovascular events in patients who have recently experienced acute coronary syndrome. Learn more about the study. If you would like to learn more about this trial, please follow the link below or contact Tina Fortney at tina.fortney@overlakehospital.org. Mild and Rapidly Improving Stroke Study (MaRISS) is a joint endeavor between the Americal Heart Association, Americal Stroke Association and the University of Miami. The MaRISS study was designed to help address a critical knowledge gap: What are the long-term outcomes of patients with a diagnosis of mild stroke? What do they experience after discharge? This will be the first ever large-scale prospective study to evaluate the long-term outcomes for these patients in a standardized manner. If you would like to learn more about this trial, please contact Tina Fortney, RN, CCRC at 425.688.5407 or tina.fortney@overlakehospital.org. Possibility of early access to innovative therapies that may be better than current treatment options. Study-related healthcare provided by a team of experts, including top physicians and researchers, along with nurses, statisticians and social workers. Enhanced patient monitoring and individualized care. Increased understanding of the disease and its treatment. Possibility of unknown side effects. New drug/treatment may be ineffective or less effective than current options. Greater time commitment to treatment. Not everyone with a specific disease or condition is eligible. Type and extent of disease, age and health status can determine your eligibility. But if early results of an experimental treatment are encouraging, eligibility is usually broadened. If you are interested in any of the listed protocols at Overlake, you may contact Tina Fortney, BSN certified clinical research supervisor, at 425.688.5407. Clinical trials follow strict scientific guidelines and ethical principles. A researcher must prepare a written document called a “protocol.” This explains and details the treatment plan, rationale, the number of patients who will be enrolled in the study, as well as the examinations and tests the patient will receive, and how often. The sponsoring institution or clinical cooperative group that coordinates the study, along with a review board and ethics committee, must approve protocols. This Institutional Review Board (IRB) includes both national and local experts. In addition to clinicians, the IRB may consist of medical consumers, other health care professionals, clergy and lay people to ensure that the research will not expose patients to extreme or unethical risks. Once a protocol has been approved, the committee must be informed of any new findings or any modifications, which also must be approved. Informed Consent — a process through which potential participants learn the purpose, risks and benefits of a clinical trial before deciding whether to participate. This process continues throughout the study. Confidentiality — no one should be allowed to identify you as a research volunteer unless you give permission to use your name. Overlake Medical Center is home to a number of clinical trials in collaboration with other first-rate institutions such as the University of Washington and the Fred Hutchinson Cancer Research Center. Phase I involves a small number of people and is the first study on humans. The goal is to see if the treatment is safe, if it has harmful side effects, and how is best administered. If the results are positive, researchers move on to Phase II. In Phase II, trials measure the new therapy's safety and effectiveness in fighting disease. Still, only a small number of participants take part in these studies. If benefit is demonstrated, it moves on to Phase III. Phase III examines how the new therapy compares to standard treatments, the "benchmark" for measuring and evaluating new and improved possibilities in medical treatments. These trials involved hundreds of participants at different hospitals, cooperative groups and research centers. In these phases a trial examines a therapy once it has been approved by the Food and Drug Administration (FDA) approved and the therapy is available to the public. Usually several hundred to several thousand participants take part in these studies. They assist in further evaluating the long-term safety and effectiveness of a new treatment. There are also studies that are designed to improve comfort and quality-of-life for people who have been diagnosed with a disease such as cancer, heart disease or diabetes. These types of trials may study the impact of treatment or services on patients, their family members, or the healthcare providers caring for these individuals. In addition, there are clinical trials, which include the collection of tissue or blood specimens that will be used for testing new technologies or therapies. In all of these trials the objective is furthering the understanding a disease and its impact on patients. Many of today's most effective treatments in healthcare are based on previous study results. Because of progress made through clinical trials, many people are living longer. Clinical trials are a critical part of the research process. Clinical trials translate basic scientific research results into better ways to prevent, diagnose, or treat disease. Clinical trials are the final step in a long research process. The more people who participate in clinical trials, the faster critical research questions can be answered that will lead to better treatment and prevention options for all cancers. We will never know the true effectiveness of a treatment or a way to prevent specific diseases such as cancer, heart disease, or stroke unless more people are involved in clinical trials. In the past, clinical trials were sometimes seen as the last resort for patients who had no other treatment choices. This is not true; there are many clinical trials for prevention of certain disease processes. We must also keep in mind clinical trials may provide us with the newest way to treat a disease that is not available any other way. Once a new drug or intervention is proven safe and effective in a clinical trial, it may become the new standard of practice. Everything we can tell people about treatment options for their medical ailments today is based on the results of clinical trials. Members of the interested public can help speed up the research process. It takes 14 years, on average, for an experimental drug to travel from laboratory to U.S. consumers. Often the longest part of the process is finding people to participate in each trial phase. With increase public awareness about clinical trials, more people may be willing to participate, and more professionals may refer people into appropriate trials. This awareness ultimately reduces the time it takes for researchers to enroll participants in trials and complete them, and speeds the movement of new drugs or treatments into standard care. Lake Washington Vascular is the region’s center for total vein and artery health, where our vascular surgeons, specialists and diagnostic lab identify medical advances and integrate them into ever-advancing care. A network of 25 regional stroke centers working with nearby satellite facilities will span the country, have teams of researchers representing every medical specialty needed for stroke care and will address the three prongs of stroke research: prevention, treatment and recovery. The Centers were announced today by the National Institutes of Health. “The new system is intended to streamline stroke research, by centralizing approval and review, lessening time and costs of clinical trials, and assembling a comprehensive data sharing system,” said Petra Kaufmann, M.D., the associate director for clinical research at the National Institute of Neurological Disorders and Stroke (NINDS). Overlake is participating as a satellite through Harborview and the University of Washington, which is one of the regional centers. Since 1983, the National Cancer Institute (NCI) has extended cancer research into the community and facilitated the translation of research into evidenced-based practice through the Community Clinical Oncology Programs (CCOPs). For the past 30 years, cancer patients in the Pacific Northwest have had access to NCI-funded oncology clinical trials via two large community based research networks: Northwest CCOP and Virginia Mason CCOP. Northwest CCOP and Virginia Mason CCOP joined last year to form the Northwest NCI Community Oncology Research Program (NW NCORP). According to the NCI about 85% of cancer patients are treated in or near their communities. Community hospitals keep patients close to family, friends and jobs, while treatment at major cancer centers may require extended commutes or long stays away from home. The overall purpose of the NW CCOP is to bring clinical advances through the most cutting edge research protocols to local communities. Overlake is proud to be a research partner with Northwest COOP through MultiCare. Accelerate access to clinical trials in "real-world" health care delivery settings for cancer patients across the lifespan (pediatrics, adolescents, young adults and adults). Build infrastructure for the cancer care delivery research program (CCDR) in preparation for the capacity to conduct CCDR clinical trials across the NW NCORP Network. Develop active strategies for enhancing interaction with NCI-supported programs. You can find out more information about any of the cooperative's trials by visiting the website. Overlake Medical Center is actively working with cancer patients choosing to participate in a Phase 1 clinical trial of a new investigational product with the potential to dramatically change the landscape of cancer surgery.